The process for getting a raise at my company used to be super easy, until I learned that most people didn’t know what it was, and if they did, they were terrified. My intention was to keep the organization as flat as possible, be very transparent and provide an open-door environment. The only time my door was shut, was when some poor soul had summoned the courage to do what I thought was fun and easy, ask the CEO for more money. I have always been interested in optimizing our company so that employees can do their best work. The goal is not only to add the most value to our clients, but also provide an environment where people are creative, productive, and excited about their work. Our first step was measuring culture. 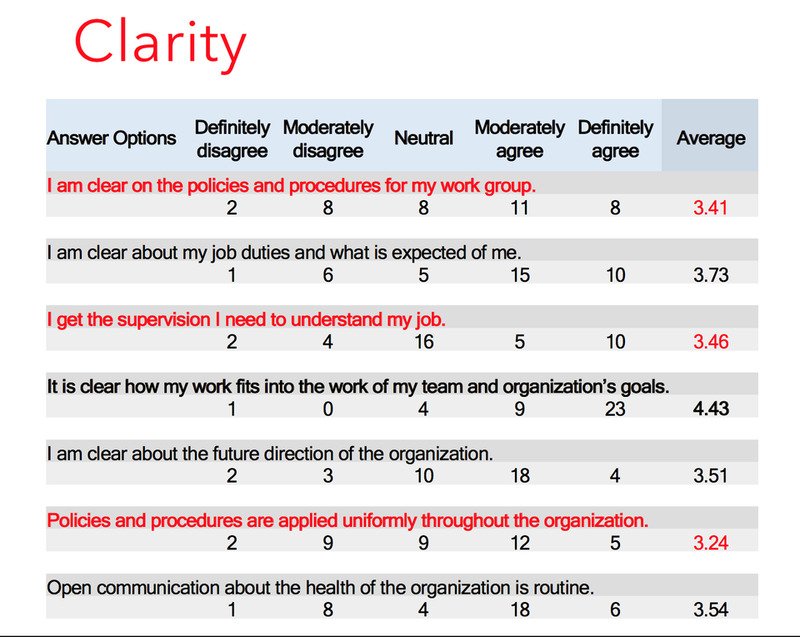 When we conducted our company-wide culture survey, I thought our clarity score would be high. I talk all the time about what’s going on financially, operationally and about our growth plans for the company. It turns out clarity does not mean that I tell people what I’m working on. Clarity is more complicated, and is an essential ingredient in having a thriving, productive culture, which has a direct link to profit. As a consulting services company, we are built on people. Without highly engaged, smart and passionate employees working hard on client projects, we don’t exist. In order for someone really to be focused and therefore productive, they need to know what their priorities are, know their responsibilities, and our expectations of them. Things like a clear job description, a known career path, a manager with tools to help them achieve their goals, and a known process for when, how, and how much of a raise someone should ask for, all feed into a clear sense of purpose. And these elements help them prioritize in their day, or overall job. I used to think that entrepreneurial spirit was a great way to run a company. I thought people wanted freedom to grow, to take care of themselves and ask for what they need, when they need it. But the reality is that most people are not entrepreneurs. They actually want and need guidance, support and clear expectations in order to be successful. Below are two of the most surprising dimensions from the six measured in our company-wide culture survey. The survey is constructed based on current research and measures the fundamental elements people need to perform consistently at high levels. I thought we would be hitting fives across the board, maybe fours in the areas that I knew we were working on, but never twos and threes. The Clarity dimension produced some of the most surprising results from our company-wide culture survey. I expected we’d hit fives across the board, not low threes. Closely linked to Clarity is Rewards, where I also expected to hit fours and fives. The first score dropped my jaw and sent me directly to the (Cognitive Psychology) doctor. Getting the unexpected results from our culture survey and understanding how it is connected to our bottom line became my obsession. I spent weeks with my advisors from Calibrate LLC, I wanted to understand more about human psychology and how it is linked to workplace productivity. We explored what culture really means and how to clearly talk about it, hire and on-board new employees in light of it, measure and base performance on it. And perhaps most importantly, how to continually improve it. I also joined communities such as the Small Giants Community, who bring together values-driven leaders who put people first and grow with purpose. I read reports from the Return on Values Project (ROV), a multi-year research project that links the relationship between culture and profit in small and mid-size businesses, and I even started a Ph.D. in Values Driven Leadership at the Benedictine University in Chicago. 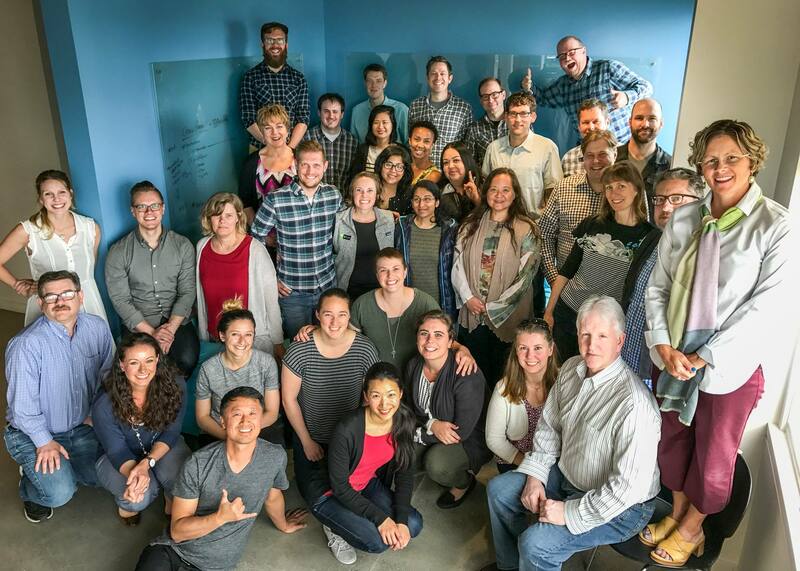 One of the most tangible results from measuring culture was formalizing our version of a Culture Framework, which all of our managers use as guidelines for growth and support. It also provides a great standard for what matters in hiring and firing. The framework has six pillars, which can be implemented and measured at both the company level and the individual. The dimensions we included in Blink’s Cultural Framework include Feedback, Clarity, Rewards, Standards, Team Commitment and Responsibility. We developed this based on best practices of Cognitive Psychology, in conjunction with the team at Calibrate LLC. In the end, I realized that there are so many other pieces besides the framework that are connected to creating a high-performing culture, I wanted a software tool that could capture all the data and show everyone the cause and effect of everything they were doing. So we designed and built one. Our “Grow Tool” tracks and measures data for an employee’s career at our company. It pulls in data from many sources and provides a timeline that the employee or manager can review on a daily, monthly or yearly basis. It replaces the annual review process and instead provides the data with real cause and effect information at any time. So, while beer in the fridge and Massage Thursdays are still important, it turns out that feeling valued beats it all. A game of ping pong may grant a desired office reputation, but it doesn’t help a person feel more respected or appreciated for the hard work they do every day – and then inspire them to do it year over year. The great side effect of creating a thriving work culture is that when a person feels valued at work, they carry that home. This in turn benefits their families and communities. Communities where people like our clients may also just happen to live. That's a lot like the bottom line coming full circle. Karen is the Chief Executive Officer (CEO) and Co-Founder of Blink UX. 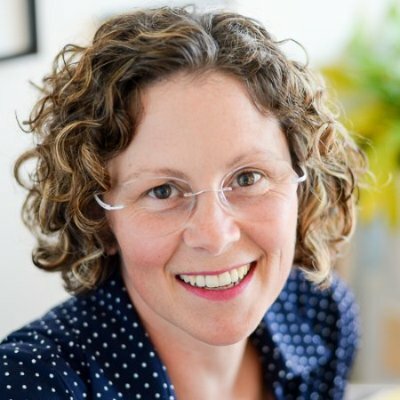 Today Karen is primarily focused on Blink’s culture and employees, communicating the company vision, and setting the company’s growth strategy. Karen also wears the Chief Operations Officer (COO) hat and spends time speaking and writing. When not serving as CEO of Blink UX, you can find me organizing events to inspire young girls or training to become a professional kiteboarder.